I made a silly cake! 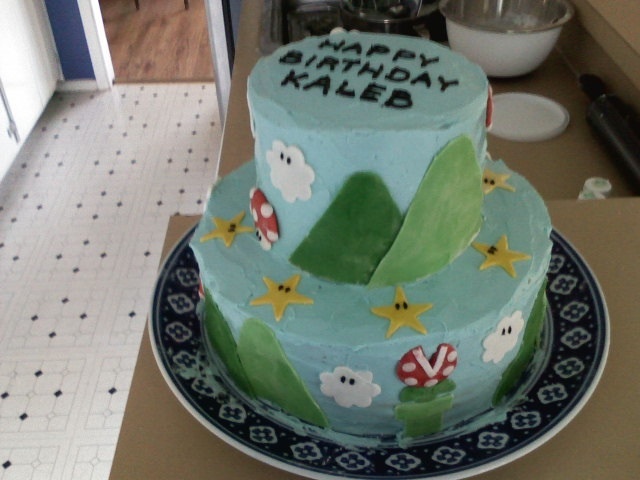 My dear friend Erin mentioned that she was looking for a Super Mario Bros cake for her son Kaleb’s 9th birthday, and I jumped at the chance. (I was the happy recipient of some lovely cake-decorating tools this Christmas, and had been looking for an opportunity to try them out). I’m somewhat bashful to admit that this cake took nine hours from start to finish. Egads. I had fun though! I had never made a two-tiered cake like this before, and was pleasantly surprised that it wasn’t quite as tricky as I had feared. This how-to guide helped in the assembly process. For the cake, I made a double-batch of Martha’s Yellow Buttermilk Cupcakes and a single batch of her Swiss Meringue Buttercream, both from the charming Cupcakes book. The bottom tier is 10″ and the top is 6″, with the requisite support of wooden dowels holding up the top tier. I made all the decorations with gum paste, which is just a powder you mix with water and tint by kneading in food coloring gels. Pictured below: I also tried my hand at making cake pops for the first time. 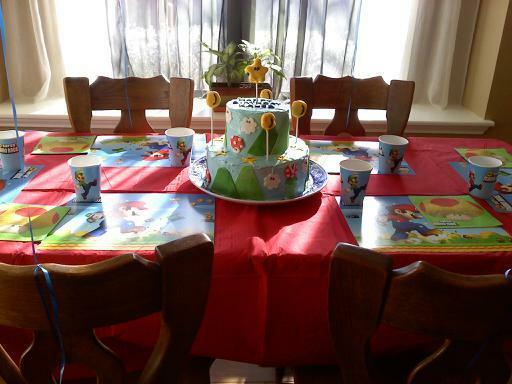 I used the instructions from Bakerella to make one chubby little Mario star for the top of the cake, and several coins, all on lollipop sticks, to be stuck into the cake when it reached the birthday boy. What a wonderful cake! It looks awesome! I think this birthday cake looks magical! What a darling cake. I bet the Birthday Boy was very happy. Yeti! The cake looks SO GREAT, especially on that pretty table Erin!! What fun, I'm excited to hear how it tasted! P.S. Yahoo for the cake balls too! This is THE greatest cake ever!! All the 9 year old boys are crazy about it. We just sang and cut into it and it is so delicious! Thank you so much for helping make Kaleb's birthday so wonderful, Arielle! P.S. The cake balls are AWESOME! @ Helen: thanks, sister! yes- i'm so happy Erin sent that picture of the cake with the star and coins!